It may look like something you’d use for target practice, but this is a new kind of sensor that can detect the presence of all kinds of light—and reacts to it in super-quick time, too. In fact, the graphene sensor is, according to the researchers that built it, the first time that a single detector has been able to monitor such a huge swathe of electromagnetic spectrum— from visible light, through infrared radiation, and right the way through to terahertz radiation. It was built by a team from at the Helmholtz-Zentrum Dresden-Rossendorf labs in Germany. [T]he graphene flake and antenna assembly absorbs the rays, thereby transferring the energy of the photons to the electrons in the graphene. These “hot electrons” increase the electrical resistance of the detector and generate rapid electric signals. The detector can register incident light in just 40 picoseconds — these are billionths of a second. 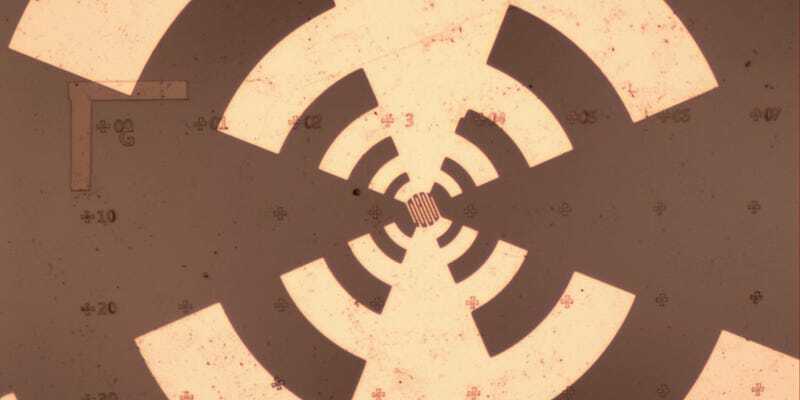 Compared to other similar antennae made in the past, this device provides 90 times the spectral range, and can detect signals with the shortest wavelength is 1000 times smaller than the largest. The research is published in Optics Express. If you’re wondering what use such a device might be, well, it’s already being used to synchronize lasers. Because the detector can register light so quickly, it’s being used to calibrate multi-laser systems, ensuring that laser pulses reach their destinations at the same time. Think of the graphene sensors as a kind of a stopwatch—a very clever stopwatch.